"Flat tire!" adventure-motorcycling videographer Sterling Noren called out from his BMW F800 as we rode from our campsite along the Colorado Backcountry Discovery Route. He was there to film the Touratech USA- and Butler Motorcycle Maps-sponsored inaugural ride of the border-to-border route. I was there to write about it for RoadRUNNER, the motorcycle-travel magazine. COBDR campsite where Sterling Noren's BMW got a flat tire. Sterling's words are among those that every ADV-style motorcyclist dreads, for they proclaim the inevitable along America's wildest roads. It was the second flat of the trip. Flat tires happen to us all. So within seconds Sterling had plenty of helping hands, and soon his fully loaded Beemer was back on the "off" road. Adventure riders and "overland" travelers sometimes travel in groups. In a pinch, the group becomes the pit crew. Many of our clients, however, travel solo or as couples. We routinely do so. And when traveling without group backup, a traveler must be prepared to deal with flat tires alone (replacement tubes or patches, small electric air pump, bottle of lube, tire spoons, center stand on the bike ... and practiced skill). Having the know-how to repair a flat tire roadside is a standard bit of kit for motorcyclists who travel backcountry roads. Out there, bits of barbed wire, fence nails and other assorted agricultural debris often lurks in the center or on the sides of dirt roads. (A few years ago, 20 miles from home base in Idaho on our way to ride a portion of Sam Correro's Trans America Trail, we got a large nail in a brand-new rear Continental TKC80 that was mounted some 30 minutes earlier ...). A bolt punctured a tire on Sierra to the Sea ADV route. The proper tire, tools and techniques are everything (carry three tire spoons ... keep the bead in the well of the rim to give the tire room to fit over the rim ... Be generous with the lube ...). And of course ... practice practice practice. Moto folk also have various devices marketed as preventives, each with its pros and cons, and costs. No help was to be found in a Montana ghost town. SUV- and pickup-borne backcountry travelers typically will carry a full-size spare tire, plugging kits for tubeless tires, perhaps some liquid sealant and a can or two of inflator/sealant. The usual solution for motorcyclists is know-how that comes from practicing at home. Rocks destroyed a Michelin all-terrain tire on our 4Runner. For four-wheeled travelers, the lucky ones, mounting the spare tire and/or plugging the puncture with one of those fibrous-plug kits will be enough to get back to civilization. As often as not, however, the tire will be destroyed. 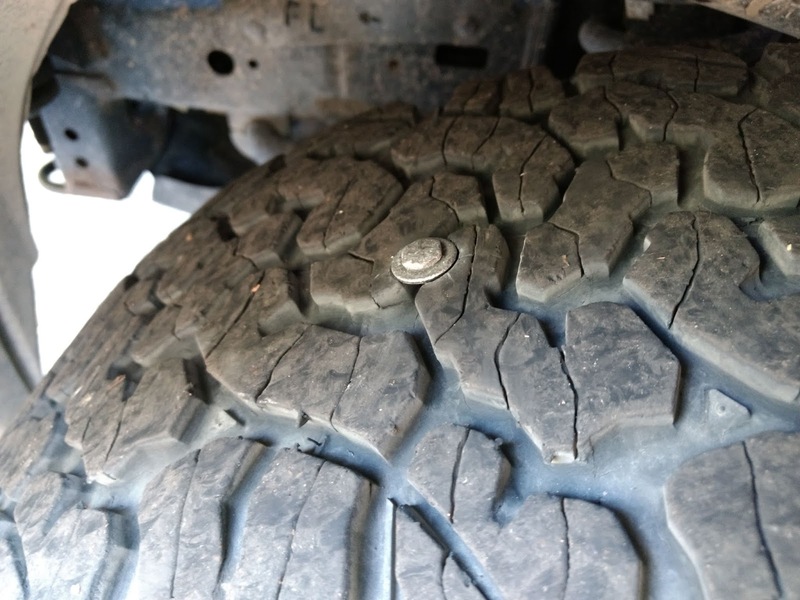 A rock will tear a large, jagged and unpluggable hole in the tread or the sidewall. And once the spare is mounted, the truck will no longer have a spare, and the trip may need to be suspended or even terminated. The alternative, if a second flat occurs, could be a $1,000 towing charge. Our advice: Carry two spare tires. This is not theoretical; it happens. We've gotten two flats in a day. We've visited with travelers who've had trips ruined. There are YouTube videos on the topic. And we've had clients who disregarded our advice to carry two spares ... and paid the heavy price of a tow, often in the $1,000-plus range. That happened a couple of seasons ago to a couple on one of our custom routes through Nevada and Idaho. Their full-size, off-road edition SUV came with a "donut" spare for 50 paved miles. But they were miles from paved roads. And a cowboy who stopped to help when they thought the situation involved only one flat noticed that they were in fact getting a second flat while fixing the first. So our advice is to SUV travelers is to always carry two spare tires. But how? A modern 17- or 18-inch wheel/tire combo takes up a lot of space. It may not fit inside with camping gear, cooler, etc. The roof rack may be a good option, if the wheel can be securely attached so it doesn't migrate around. But more and more SUVs are losing rooftop cargo capacity to rooftop tents. Second spare tire on a Yakima Load Warrior basket and rack. The solution we found for our fleet of three Toyota 4Runners is a tow-hitch-mounted spare-tire carrier made by California's Wilco OffRoad, specifically their Hitchgate Solo High-Clearance. At well over $800, the Hitchgate Solo is an expensive solution. But with three 4Runners in our research fleet, it has been a practical solution that can be swapped among the trucks. We found a refurbished matching wheel on eBay, and a good-enough used tire at our favorite local tire shop. And yes, we've used them. So however you manage to store a second spare wheel and tire, it should be standard equipment. If you're a moto traveler, the ability to repair one should be a well-honed skill acquired the easy way: with YouTube videos, and practicing at home.